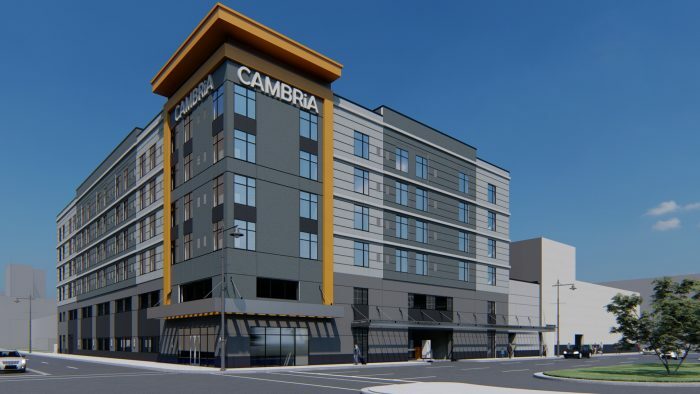 The new 154-room Cambria Hotel will be located at 600 W. Lafayette Blvd., on a site currently known as the Walker-Roehrig Building, and is part of a $47 million project that includes restaurants, a rooftop lounge, office and retail tenants. The project includes 150,000 sq. ft. of modular construction on the adjacent surface lot that will include a two-story parking structure that can accommodate 150 spaces, and four stories that will house 154 hotel rooms. As we did with “The Corner” on Michigan Avenue at Trumbull, AEW is serving as a sub-consultant for Champion Commercial Structures, providing drafting services and structural design for the modular portion of the project. Choice Hotels International Inc., signed an agreement with 600 Ventures II LLC, a joint venture that includes The Means Group Inc. and Holdwick Land Development LLK, both based in Detroit, and Koucar Management, located in Troy.